The debate of the century; Spotify vs Apple Music. In this article we will give you all the facts and leave you to decide-Apple Music or Spotify. The positives to Spotify are in abundance. Along with a subscription to unlimited music, you get the choice to have a free membership or a paid one. This is something that Apple Music does not offer. The downfall to a Spotify free membership is that it comes with ads, you can only shuffle playlists, and you have a limited number of skips. On the flip side, with a paid membership for Spotify all of these “downfalls” go away. Another pro to Spotify is that with a paid membership you also get memberships to Hulu and SHOWTIME. The upsides to Apple Music include: a free three-month membership, if you are a musician Apple Music allows you to upload your music, also it will adapt your “new music” to music you generally lean towards. More positives to Apple Music are offline listening, and overall availability. Apple Music is available in 114 countries, while Spotify is only available in 60 countries. There are packages to both music platforms. Spotify’s different packages are Spotify free, which is no charge. Spotify premium which includes: ad-free music, Hulu, and SHOWTIME for $9.99 per month. Spotify students, same package as premium, but only $4.99 per month. Spotify student packages are only available for students currently in college. Lastly, they have a Spotify premium for families, which holds up to 5 family members that reside at the same address, and is only $14.99 per month. Apple Music has three different plans. They consist of a student plan that is $4.99 per month, an individual plan which costs $9.99 per month, and a family plan which holds six people for $14.99 per month. 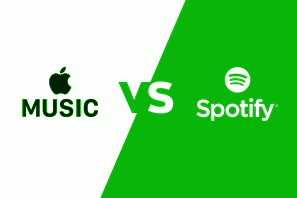 The debate will continue to go on, but now you can decide for yourself with knowing all the facts… Apple Music or Spotify?